Nicole Engard reminds us that libraries are already experts in pulling together data from different sources. Whenever I teach libraries about mashups I start with a picture of a s'mores (a popular campfire treat in the US). 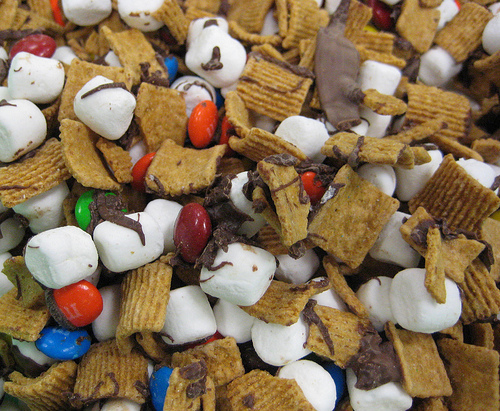 What's better than chocolate, marshmallow and graham cracker all smooshed together?! The term mashup was first used in the music industry to define songs made from mashing two others together. Glee fans worldwide will be familiar with this type of mashup. But today we're not talking about food or music mashups we're talking about technology mashups. A mashup in this sense is just like a s'mores; it's data from several sources all smooshed together. More accurately, a mashup takes information from multiple providers and uses the power of APIs (application programming interfaces) and web services to bring it all together into one tool. Libraries have been creating mashups for years, some without even knowing it. Does your library have a subject guide on your website? That's a great example of bringing data from multiple sources together to create a single tool. When I first started working in libraries I was in charge of maintaining our subject guides. I would have to add/edit links by hand in HTML whenever a librarian found a new or updated resource. I used to wish there were an automated way to manage those links and, once I learned a bit more about computer programming, I was able to write a solution. My solution though wasn't as graceful as that of the Chelmsford Public Library in Massachusetts. They decided to create a mashup of Delicious and their library website to manage their subject guides (a trick I now use on all of my book websites). At Chelmsford the website was managed by a separate web department. This meant that if they wanted to change their subject guides they would have to email the webmaster the links they wanted and then wait for someone to make the changes. Then they'd have to go back and forth with the web team to get things just right. They decided that instead of this back and forth they would sign up for an account on Delicious and share the login with all of the reference staff. Next, they agreed on a controlled vocabulary for tags and then they used the Delicious API Feeds to pull data from Delicious and embed it on their library website. The process made it so that whenever a librarian bookmarked a new resource in Delicious and tagged it with one of the controlled terms (consumer_information for example) the library website updated automatically. While libraries have used many more complicated mashups, most of them are as simple as reading a little bit of documentation on a site like Delicious and thinking about how it can improve services and efficiency at your library. To learn more about mashups in libraries check out Library Mashups: Exploring New Ways to Deliver Library Data and keep an eye out for the forthcoming More Library Mashups title published by Information Today Inc. in 2014. To learn more about mashup terminology refer to the Library Mashups Glossary at http://mashups.web2learning.net/glossary/. Nicole Engard is Vice President of Education at ByWater Solutions and the Editor of Library Mashups: Exploring New Ways to Deliver Library Data. Picture of S'mores snacks courtesy of Barbara LN via Flickr.